Maps of the fifteenth to eighteenth centuries are a favourite source of information for fringe writers, who use them to make a wide variety of claims. To Erich von Däniken, for instance, they are evidence for a survey of the Earth from space, carried out by extraterrestrials, while for Graham Hancock, they are evidence for an ancient sea-faring civilisation, lost beneath the sea after the melting of glacial ice at the end of the Pleistocene. These writers focus on a relatively small number of such maps, those of Piri Re‘is and Orontius Finaeus being the most used, whilst ignoring others of the same age. All these maps are alleged to show anomalous knowledge for the dates at which they were drawn: the west coast of South America, Antarctica (with or, more frequently, without its ice sheet), the Strait of Magellan and other “impossible” details. This appears to be solid evidence, so why do mainstream historians and archaeologists ignore it? The most widely used of these maps is a manuscript map produced in 1513 CE by Hacı Ahmed Muhiddin Piri, better known as Piri Re‘is (“Admiral Piri”, although most of these writers seem not to understand that Re‘is is a title, not a surname). It was drawn on camel-skin parchment and is one surviving part of an originally larger set of maps depicting the known world. Since its rediscovery by the German theologian, Gustav Adolf Deissmann (1866–1937) in the Topkapı Sarayı Museum in 1929, it has been an important source of claims that there were much older maps showing the world in great detail, including places unknown in the early sixteenth century CE. Much of the detail in these claims derives not from scholarly studies of the map but from the work of Charles Hapgood (1904-1982), a geography teacher at Keene State College (whose status is often inflated to ‘professor’ through a misunderstanding of American usage of the term). The inspiration behind Hapgood’s work was a radio discussion on 26 August 1956 between Arlington Humphrey Mallery (1877-1968), an engineer then working for the US Navy Hydrographic Office, Rev Daniel L Linehan SJ (1904-1987), director and chief seismologist of the Weston Observatory at Boston College, and Rev Francis Heyden (1907-1991), director of the Georgetown University Observatory. 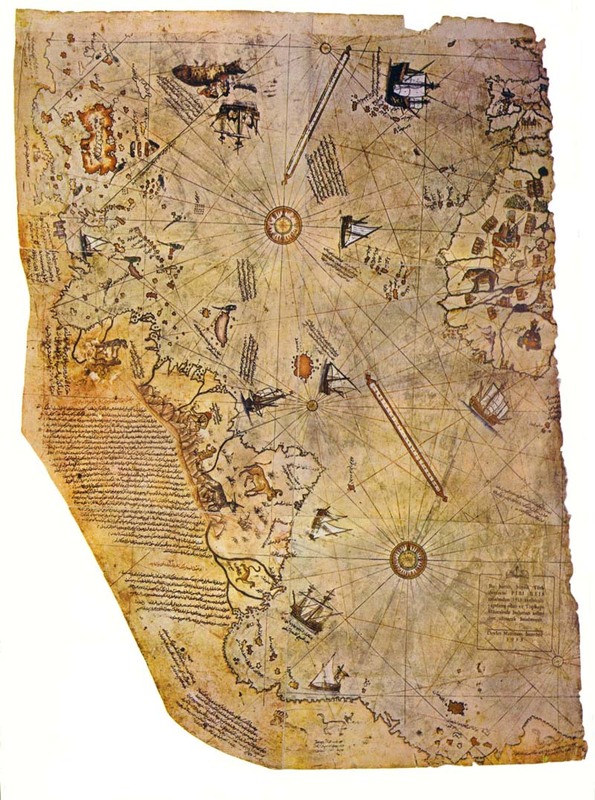 Mallery, something of a student of the history of cartography and an amateur archaeologist, had formed the view that the bays and islands depicted at the bottom of Piri’s map were hidden beneath the ice of Queen Maud Land (Antarctica). 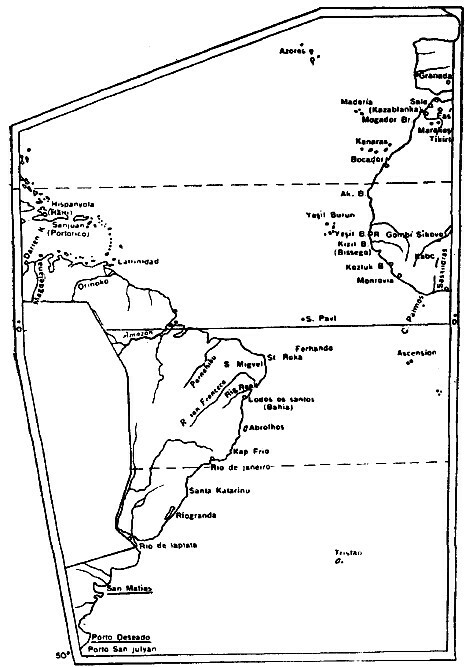 After reading a transcript of the broadcast, Hapgood contacted Mallery and, having obtained a copy of the map, set his students to work examining it. Hapgood’s account of the investigation, in Maps of the Ancient Sea Kings (1966) is tedious to anyone, like me, with little or no interest or ability in maths. He detected the use of a grid on late medieval portolan charts and suggested that a similar grid was used by Piri; he conjectured that it was based on Syene (Aswan, Egypt) and that similar grids were used on other early medieval maps. This may have been a correct deduction (although it appears not to be generally accepted by historians of cartography, who believe that portolans were based on compass directions), but it is the next stage of Hapgood’s analysis where the claims made for the map go way beyond the evidence. Hapgood started with the belief that the Piri Re‘is map was an accurate depiction of South America and part of Antarctica but when close analysis showed that it was not accurate in any projection he and his students applied to it, had to come up with a reason why it contained errors. Given that Piri stated that he had used “about twenty charts and Mappae Mundi” and that some of them were “drawn in the days of Alexander”, Hapgood conjectured that Piri’s map (or its sources) had wrongly combined numerous earlier sources of varying scale, orientation and projection. In this way, small sections of coastline were drawn accurately but each section had to be looked at in isolation. Worse, some parts of the coastline were missing (so that the Strait of Magellan was not depicted, for instance) and some were duplicated. In this way, Hapgood and his students could rescue Piri’s map from any suggestion of inaccuracy. This section shows how this map was drawn. In this century, there is no map like this in anyone’s possession: the hand of this poor man has drawn it and now it is assembled from about twenty charts and Mappae Mundi (these are charts drawn in the days of Alexander, Lord of the Two Horns, which show the inhabited quarter of the world). The Arabs name these charts Caferiye. I have compiled it from eight Caferiyes of that kind, one Arab map of India, from the maps recently drawn by four Portuguese that show the countries of India, Sindh and China drawn geometrically, and also from a map drawn by Columbus in the western region. 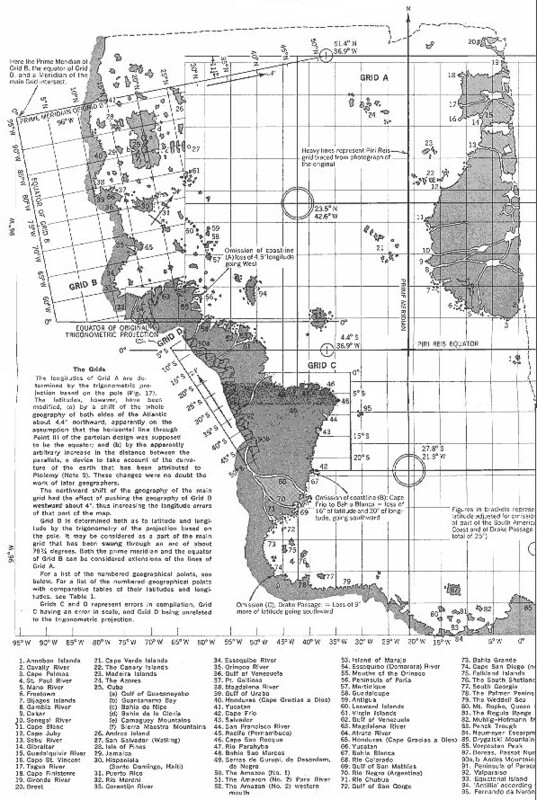 The present form was achieved by reducing all these maps to a single scale so that this map is as correct and reliable for the Seven Seas as the map of our own countries is considered accurate and reliable by sailors. It is quite clear from this that Piri’s only source for the “western region” was a map he attributed to Columbus. The Mappae Mundi “drawn in the days of Alexander” were not charts 1800 years old when Piri acquired them but maps based on Claudius Ptolemy’s Geographical Guide (Γεωγραφικὴ Ύφήγησις, more commonly known as the Geography), which had become the standard for accurate mapping in the Arab world and in Christian Europe after a text was brought from Constantinople in 1400. Rather than dating from “the days of Alexander”, the original work dated from c 150 CE and although the only copy that Maximos Planoudes (Μάξιμος Πλανούδης, c 1260-c 1305) was able to locate in Constantinople in 1295 had lost its maps, the tenth-century al-Masʿūdī (أبو الحسن علي بن الحسين بن علي المسعودي, Abu al-Ḥasan ʿAlī ibn al-Ḥusayn ibn ʿAlī al-Masʿūdī c 896-956) was familiar with a copy that may have retained them. These maps dealt with only those parts of the world known to Ptolemy; Piri used more recent maps to update them. What this means is that Hapgood’s attempt to rescue his hypothesis is just plain wrong: Piri is absolutely explicit that his only source for the “western region” was a chart he believed to have been compiled by Christopher Columbus. Piri may or may not have been correct in this belief, but either way, his sole source for the western continent was a map deriving from the voyages to the New World by European explorers after 1492. Had there been earlier maps available to him, we would have to explain why he did not mention them as sources. So, why did Piri show a land apparently south of the South Atlantic? Is this evidence for an early discovery of Antarctica? Alas, no. The authority of Arlington H Mallery is not quite what it seems: although fringe writers tend to refer to him as an expert on historic maps and an archaeologist, with the implication that his work for the US Navy’s Hydrographic Office was connected with cartography, this is not correct. He was a civil engineer and inventor of a swivelling head block transfer bridge for transferring railway trucks to and from canal barges that is still known as the Mallery Type. He was an enthusiast for old maps and his archaeological opinions were a long way from the mainstream. In 1951, he published Lost America: The Story of the Pre-Columbian Iron Age in America, in which he argued that there was an Iron Age in North America, inaugurated by Viking settlers. He was, to put it bluntly, a crank. We can dismiss Mallery as an authority, but does this mean that Hapgood was also wrong to identify the land at the bottom (south) of the map as Antarctica? To see it as such, one must ignore the placenames written in this area, as transcribed in Ayşe Afet İnan’s The Oldest Map of America, Drawn by Pirî Reis (1954, Ankara). They include Rio de laplata, San Matias, Porto Deseado and Porto San julean. These are clearly the Río de la Plata, Golfo San Matías, Puerto Deseado and Puerto San Julián. In other words, this is a depiction of the coast of Argentina, twisted through 90° to fit onto the parchment! There is no depiction of Antarctica here. 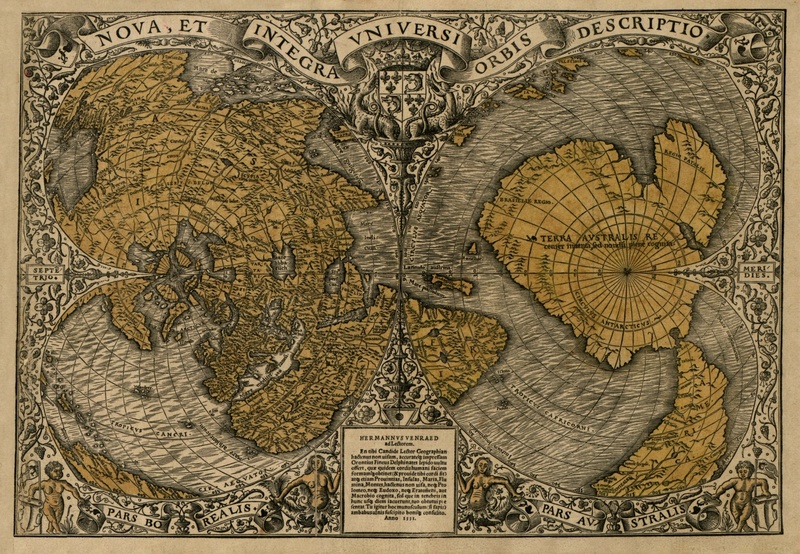 Hapgood brought a series of maps – principally those of Orontius Finaeus (1494-1555), Hadji Ahmed and Gerardus Mercator (1512-1594) – to bear on the question of knowledge of an Antarctic continent at a much earlier date than is usually believed. The maps he used are superficially impressive: they depict a continent that somewhat resembles what we now know to be the shape of Antractica, albeit one much larger than the real continent. In particular, they lack the Antarctic Peninsula, the continent’s most prominent and characteristic coastal feature. Those who get excited by these supposed maps of Antarctica that pre-date its discovery take the maps as if they exist in a vacuum. They completely ignore books and papers written by the cartographers themselves, which often explain the methods they used. Piri was a careful scholar who listed his sources; they ignore the fact that those who depicted a southern continent did so on the basis of speculation about the balance of land in the two hemispheres; they fail to read the captions on the maps that make it clear that certain elements are conjectured or recently discovered. There is nothing in these early modern maps, then, that needs explanation. We understand a lot about the context of their production and often have the very words of those who made them. We know their sources and, much of the time, the voyages of discovery that enabled Arabs and Europeans to chart previously unknown coastlines. These maps are interesting for what they show and also for what they do not: the Piri Re’is map, for instance, does not show inland details as it was made by sailors as a navigation aid, quite different from von Däniken’s idea that it was copied from an ancient aerial survey. The real mystery is why so many fringe writers continue to promote them. A fine article. Your emphasis on known context is refreshing. Ideas rarely pop into even the most brilliant of heads without some prodding. Of course taking things out of, or ignoring context altogether, is a standard way of advancing even newly minted bogus claims. For example where is all the Bigfoot feces? That was an interesting read. Thank you very much for this blog, these are very interesting subjects. I do enjoy reading about fringe theories to see how far people’s creativity can go, and some of them are true sources of inspiration for fiction, but really, someone has to occasionally nudge the bad archaeologists and put them back in their place. In mathematics, it’s relatively easy to ‘prove’ 1=2 and also ‘counter prove’. Unfortunately in sciences that deal with history such as archaeology and paleontology, it requires much better clarity, like what you have shown here, to take down a claim as a fraud. Thanks ! Would you mind to blog a similar clarification for pyramids? For example, claims are made that pyramids are perfectly designed and are engineering marvels, even by today’s sense. “It is quite clear from this that Piri’s only source for the “western region” was a map he attributed to Columbus.” That is NOT what Piris said but I see your bias is working overtime. And since you are not a map expert, which puts you in the same boat as those you criticize, why should we take your word for it? Your ideas are mere opinion no greater than Hapgood’s and your idea of scholarly study doesn’t overrule Hapgood’s. “whilst ignoring others of the same age” Your problem is determing the amount of knowledge held by those other map makers was complete or not. In other words, they may not have had access to the same information and drew incomplete maps. “is tedious to anyone, like me, with little or no interest or ability in maths.” So since you are not an expert, it would be wise for you to withhold your criticism for you do not understand all the data. “(whose status is often inflated to ‘professor’ through a misunderstanding of American usage of the term).” Your personal attack simply ruins everything you say and shows that you have no credibility or scholarly status. It is clear that your agenda affects your view point and tells your readers that you are not objective but on a mission to distort what other people have done. I like the way you accuse me of a “personal attack” and then indulge in one on Jared Diamond in your very next comment. Remember what your religion tells you about hypocrites? my thoughts exactly. The writer sets out to ignore facts to destroy other facts. Completely biased review and misses the point of these early maps completely. Writer has absolutely no idea why maps were created back then and forgets not all were google maps when a person can only travel about 30 miles a day and lived about 45-50 years max. Different times and different lives. I strongly believe that these early maps showed much more then humans actually knew. Weather it was a passed on information or inherited from an early advanced (more advanced then early humans, not necessary as advanced as 20th century humans) civilizations or it was a human discovery which was darkened and kept as secret by the church, don’t know. I know one thing the church has purposely kept people in a dark, their lies and deceits held back science for hundreds of years. Remember that 300 years ago the Christian Church knew that the earth was flat and the sun was revolving around the earth ? If you happen to be a scientist who argued this and tried to prove the reality, you were either killed or stamped as a charlatan and then killed. The Church did not let these discoveries reach the common men. What was suitable for their agenda was formed into the people’s lives as God’s work what was not so good for them was simply ignored and debated. Remember – only few % of humans could read and write at this time and communication was therefore mostly verbal. It was easily changed and hid or destroyed. Are you surprised by the recent advances in science ? for thousands of years we did almost nothing and now in a past 200 years we changed all ? Not a surprise, simply the new life of humans which brought communications and information flow free of control from the Church and Government. Their controls are limited so more and more people can access what was always hard to access – new discoveries and new ideas. I imagine that your incredibly busy these days, but please don’t retire Bad Archaeology (the blog incarnation). It’s just too good! I read several entries on bad archeology – alas they took away some of the wonder of the world i inculcated in my growing up years – incluidng on the turin shround, the lost civilization of atlantis, and so on.. I actually came to your blog following up some links on archeological evidence for the ramayana and mahabharata – two epics of the indian sub-continent.. what do you think about them ? This is fascinating stuff. I was recently in the Topkapı Sarayı and picked up a newly published 2013 edition of The Book of Bahriye (Istanbul: Boyut Publications). It makes for fascinating reading; it is quite clear that Piri was aware of the European discoveries in the Americas and European navigation in general (he devotes a large segment to the Portuguese method for arriving in the Indian Ocean). ‘Reis’, by the way, means ‘captain’, not admiral. I’m not sure what ‘admiral’ would have been in Ottoman Turkish, but I’d hazard a guess at ‘reis pasha’. I don’t believe there is a glottal stop in the title. ‘In Genoa there was a stargazer whose name was Kolon. A curious book came into his possession that without doubts was from the time of Iskender. In that book they had collected and written down all that was known about navigation. That book ultimately reached the lands of the Franks but they knew not what was in it. Kolon found this book and read it, whereupon he took it to the king of Spain. And when he told the king all that was written therein, the king gave him ships. Off topic but I am just curious if you have heard about this and if you know what is being done about it? Is it still on going? I have heard about this and think it is disgusting. It is not an isolated case: all across the world, ancient sites are being destroyed in the name of “progress”. Most are invisible, buried sites. Once we have destroyed them, they are gone for ever and any knowledge that might be gleaned from this is lost. Nice blog and website! Thank you for doing this! hmm… seems a little accurate to be speculation don’t u think? I’m glad I am neither an historian nor a cartographer, but only someone with a lively intellect. That means I get to think whatever I want, and change my mind day to day, and it matters not a pin! This whole topic is engaging. Thanks to everyone who wrote on it! I think these maps that to purport to show an ice-free Antarctica look a lot more like Tolkein’s maps of Middle Earth or Numenor. “Admiral Piri”, although most of these writers seem not to understand that Re‘is is a title, not a surname” – And that affects the appearance of details on the map..how? It doesn’t. This is just the typical sociopolitical posturing used by career academics and psuedo-intellectuals the world over. “a geography teacher at Keene State College (whose status is often inflated to ‘professor’ through a misunderstanding of American usage of the term).” – In order to inflate one’s status to professor, start by inflating the head first. I’ll read their stuff instead. For one thing, there is the commentary around the edge of Buache’s map of the Southern Continent that describes exactly how he used date from the exploration by Jean-Baptiste Charles Bouvet de Lozier between 19 July 1738 and 24 June 1739. The “flash frozen mammoths” don’t have “tropical plants in their tummies”: rather, they have grasses and the sorts of cold weather flowers one might find on the slowly cooling tundra. If you’re going to chide me for not looking at evidence, you need to make sure that the evidence you cite is actually correct.